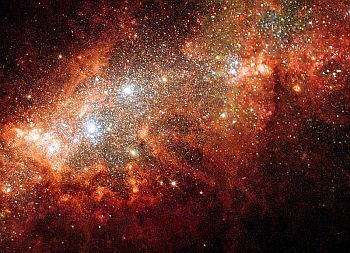 Starburst galaxies are ones that display an extremely high rate of star formation, sometimes 1,000 higher than a "normal" galaxy. As this mechanism uses up the dust and gas within the galaxy very quickly, the "starburst" period can be considered a relatively short phase in the evolution of the galaxy. 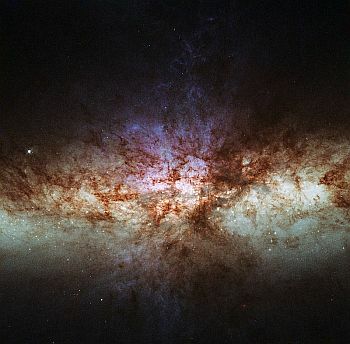 Here we see Messier 82, considered to be the prototype of this type of galaxy, situated in the constellation Ursa Major, about 12 million light years away. As a starburst galaxy requires a huge amount of dust and gas to enable the high star formation to happen in the first place, it is thought that it can be initiated when two galaxies collide or have a close encounter, and, indeed, Messier 82 experienced this with the object Messier 81. These type of galaxies seem to be quite rare in our local Universe - i.e. the more recent Universe. Looking back in time, studying Hubble's "deep field" view of the Cosmos, shows that, in the early Universe, there were many more. This is logical when you think about it: back then, the galaxies would have been more tightly packed together (before the Universe's expansion), thus facilitating the conditions required. Here we see the dwarf galaxy NGC 1569, in the constellation Camelopardalis, around 11 light years distant. It displays starburst activity in its centre. 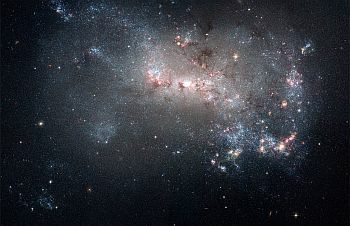 And this is galaxy NGC 4449, or Caldwell 21, found in the constellation Canes Venatici, about 12 million light years away. This is considered a global starburst, because the intense star creation is prevalent throughout the galaxy. 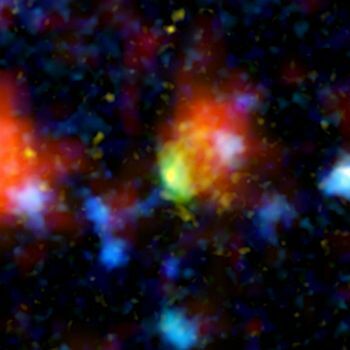 This is the quaintly named "Baby Boom" Galaxy. It has the distinction, currently, of being the brightest example of its kind in the distant Universe. It has been estimated as producing 4,000 new stars every year. By contrast, our Milky Way produces, on average, about 10. As is often the case in astronomy, there are sub-categories of this type of galaxy. These are small galaxies that consist of large clusters of young, massive, hot stars. As "hot" equals "blue", this is the colour the galaxy displays. They are very violent objects. In the year 2000, a project was begun to survey the sky that was called the Sloan Digital Sky Survey, which succeeded in covering around 35% of the heavens. Within that survey, certain small galaxies were manifested as having a green appearance. Whilst considered Blue Compact Dwarves, the colour attribute resulted in their quaint name.